Commodity exchanges, or futures exchanges, are, like stock exchanges, membership organizations. Their mission is to provide a suitable place where members trade commodities (futures) or options on futures in a controlled, orderly manner. The exchange itself is not a principal to any futures transaction, nor does it trade for its own account. Except for developing, publishing, and enforcing trading rules, including the establishment of daily price limits to ensure fair and equal treatment for all market participants, the exchange does nothing to determine prevailing prices in the market. The first organized commodity exchange in the United States was the Chicago Board of Trade (CBOT), founded April 3, 1848. When first established, the CBOT was a centralized cash market formed in response to the need for a central marketplace that would bring together large numbers of buyers and sellers; thus providing liquidity, as well as bringing traders together in a place that provided rules for ethical trading practices and reliable standards of weights and measures. Soon after the founding of the exchange, grain brokers began trading in "cash forward contracts" in order to assure buyers a source of supply and sellers the opportunity to sell 12 months a year. As use of cash forward contracts escalated, futures contracts evolved. Generally, membership on an exchange is individual, and only members may buy and sell futures and options on the exchange trading floor. Administration of the day-to-day operations of the exchange is handled by a paid staff. Members make the ultimate decisions, however, first by committee approval, then by passage by the board of directors or board of trustees. Administrative decisions are subject to full membership vote. The heart of the exchange is the exchange trading floor, where a specific area, known as a pit or ring, is designated for the trading of each commodity. Bids (propositions to buy a specific quantity of a commodity at a stated price) and offers (propositions to sell a specific quantity of a commodity at a stated price) are made by open outcry. As each transaction is completed in the pit, a pit reporter records it; this information is immediately displayed on the trading floor quotation board and also appears on computer screens in brokerage offices and trading centers worldwide. Each trade is also recorded by the participating member on trading cards; each entry shows the amount bought or sold, with whom the trade was made, the price, and the trading bracket (time period) in which the trade was made. These cards enable each member to recheck his trades, as every trade must be resolved before the start of trading the following day. (BM&F); Germany's Terminboerse (DTB); and the Marche a Terme International de France (MATIF). Table I lists selected worldwide futures and options exchanges by country with city and date established. 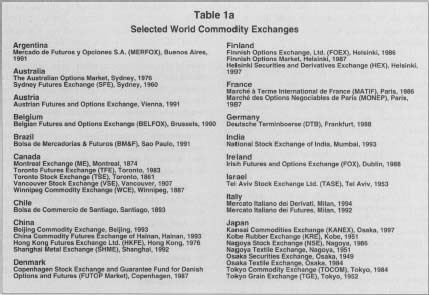 Commodity exchanges in the United States are regulated primarily under the Commodity Exchange Act of 1974, which established the Commodity Futures Trading Commission (CFTC). Exchanges must be authorized by the CFTC in order to operate and are subject to its regulatory oversight. 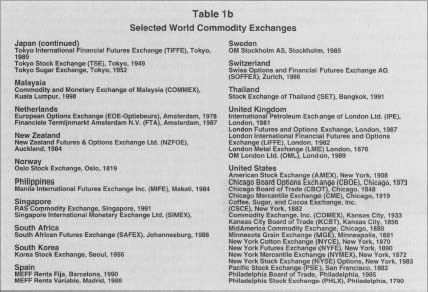 In the late 1990s some members of Congress and senators attempted to dramatically curtail the CFTC's authority, particularly concerning large institutional traders, by amending the Commodity Exchange Act. However, those efforts failed amid fears that deregulation would lead to market instability and disruptive trading practices. Chicago Board of Trade. About the Exchange. Chicago, 1999. Available from www.cbot.com/about-exchange/index.html . Chicago Mercantile Exchange. "About the Exchange." Chicago, 199S. Available from www.cme.com/exchange/back.html . Commodity Futures Trading Commission. Commodity Futures Trading Commission Annual Report. Washington, annual. Available from www.cftc.gov . Futures Industry Institute. Futures and Options Fact Book. Washington, annual. Available from www.fiafii.org/factbook/ .